In this refreshingly direct and engaging historical treatment of American music and musicology, Richard Crawford argues for the recognition of the distinct and vital character of American music. What is that character? How has musical life been supported in the United States and how have Americans understood their music? Exploring the conditions within which music has been made since the time of the American Revolution, Crawford suggests some answers to these questions. 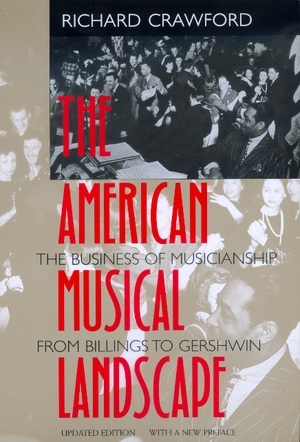 Surveying the history of several musical professions in the United States—composing, performing, teaching, and distributing music—Crawford highlights the importance of where the money for music comes from and where it goes. This economic context is one of his book's key features and gives a real-life view that is both fascinating and provocative. Crawford discusses interconnections between classical and popular music, using New England psalmody, nineteenth-century songs, Duke Ellington, and George Gershwin to illustrate his points. Because broad cultural forces are included in this unique study, anyone interested in American history and American Studies will find it as appealing as will students and scholars of American music. Richard Crawford is Professor of Music at the University of Michigan. His writings have won awards from the American Musicological Society, the Sonneck Society for American Music, and the Music Library Association.